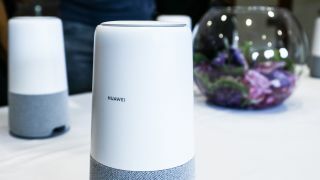 More and more companies are getting into the smart speaker market and Huawei is the latest to join, as it has just announced the Huawei AI Cube. This white speaker has Amazon’s Alexa assistant built-in, giving it similar skills to an Amazon Echo device, including the ability to answer questions, control smart home devices, play music and access a library of over 50,000 skills. The speaker aspect uses an aluminum diaphragm and a 400ml sound cavity, which Huawei claims allows for high quality audio, rounded bass and clear midrange and highs. It’s also boosted by Huawei’s Histen tech, which adds virtual bass, far-field voice recognition, adaptive gain control and more. But the Huawei AI Cube has an extra trick up its sleeve that other smart speakers don’t, as it’s also a 4G router, meaning it can be used to get devices online. Paired with a 4G SIM card it can reach download speeds of up to 300Mbps, but it also supports 2.4GHz and 5GHz Wi-Fi channels for speeds of up to 1,200Mbps. But the AI Cube isn’t all the company has announced, as it’s also launching the Huawei Locator. This is a rather different product with more niche appeal, but it could literally be a lifesaver for certain people, as it’s a compact location beacon – so you can take it into the wilderness and make it easier to be found in an emergency. It’s designed to have long operational and standby times, so it won’t die on you, and it supports GPS, GLONASS, Galileo and Beidou, offering near-real-time location reporting. Other tools offered by the Locator include an SOS button and a feature that will activate a buzzer alarm on it when a paired smartphone is within 10 meters. It’s also IP68 rated, so it can survive the rain or a brief dunk in water. Huawei hasn’t yet announced the price or availability of either product, but we’d expect to see them in some markets soon.